Professors Dixon, Gilcrease, Menkhaus, Puszynski, Salem and Winter; Associate Professors Benjamin, Sani, and Shende; Assistant Professors Brenza, Groven, and Hadley. Lecturer Pinkelman. Professor and Composites and Polymer Engineering Laboratory Director Salem and Emeritus Professors Bang, Bauer, and Munro. Chemical and Biological Engineering Administrative Assistant, Lila Baskerville. Chemical and Biological Engineering Program Assistant, Lori Litzen. Chemical and Instrumentation Specialist, Ivan Filipov. The Department of Chemical and Biological Engineering (CBE) offers a B.S. degree in Chemical Engineering which is accredited by the Engineering Accreditation Commission of ABET, http://www.abet.org, 415 North Charles Street, Baltimore, MD 21201, Phone: +1.410.347.7700 . CBE also offers a M.S. degree in Chemical Engineering and a Ph.D. in Chemical and Biological Engineering. Our department name, Chemical and Biological Engineering, reflects the forward-looking integration of chemical engineering, chemical sciences and biological sciences. With a specialization in biochemical engineering and emphases in advanced materials, biomedical engineering, energy technology, environmental engineering, and petroleum engineering you can personalize your education. An accelerated Master of Science (B.S. + M.S.) degree program is also available for qualified undergraduate students. Chemical Engineering (ChE) is an optimal combination of the molecular sciences (chemistry and biology), the physical sciences (physical chemistry and physics), the analytical sciences (math and computer programming) and engineering. Chemical Engineering focuses on the description and design of processes that combine engineering principles of heat and fluid flow with chemical reactions and molecular separations to produce high-value products useful to humankind from multiple raw material sources. Chemical Engineers do this while always insuring that the processes they design, build and manage are safe, environmentally responsible and economical. Designing and modeling such processes requires a strong fundamental understanding of the chemical and biological phenomena at work. ChE students develop a wide range of problem solving skills grounded in mathematics and computer analysis techniques. ChE graduates are recruited for their technical engineering knowledge as well as their problem solving, systems analysis, leadership skills, and communication skills. ChE graduates work in a wide variety of manufacturing, process design, and research fields. The unique combination of molecular sciences and engineering analysis make ChE professionals highly qualified for many career options in chemical, petroleum, mineral processing, pharmaceutical, food processing, biomedicine, biotechnology, semiconductor, defense, and alternative energy industries, state and federal government and academia. Recent graduates from SDSM&T have gone to work in ChE positions at 3M, ADM, Baker Hughes, Burns & McDonnell, Dakota Gasification, Dow Chemical, Dow Corning, Cargill, Caterpillar, Emerson, Exxon-Mobile, Freeport-McMoRan Copper and Gold, Halliburton, Kimberly Clark, Lafarge, Lyondell-Basel, Michelin, POET, Quadra Mining, R.S. Stover, SD DENR, Solvay Chemicals and many others. CBE alumni also regularly pursue graduate education at many of the country’s top chemical engineering research institutions such as Stanford, University of Minnesota, University of Washington, and the University of Wisconsin. To delve deeper into the broad range of exciting careers available to you in chemical engineering go to the American Institute of Chemical Engineers website (www.aiche.org) and pull down Events & Resources/Career/Career FAQ’s then click on “What exactly does a chemical engineer do?” and click on “Chemical Engineers in Action: Innovation at Work” (http://www.chemicalengineering.org/). You will find that if you wish to be engaged in discovering answers to the World’s pressing engineering challenges, Chemical Engineering is the field for you. 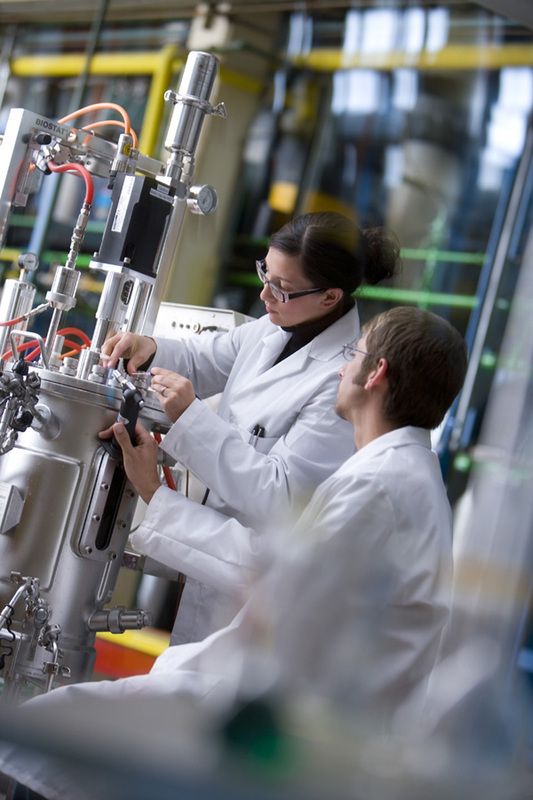 Another attribute that sets Chemical Engineering apart from many other engineering career paths is that chemical engineering opens doors to other professions. The problem solving skills and process analysis tools developed in the Chemical Engineering curriculum make ChE graduates uniquely suited to pursue careers as doctors, patent lawyers, business managers, financial analysts, marketing directors, environmental stewards, policy makers, and philanthropy directors. ChE students take multiple courses in chemistry and biology to develop a fundamental understanding of the molecular sciences. The program includes physics, math, and computer courses to provide the analytical tools required for modeling and to design processes. Finally the core Chemical Engineering curriculum includes engineering courses in thermodynamics, heat and mass transport, fluid dynamics, chemical reaction kinetics and reactor design, molecular separations and unit operations, and process design and control. Elective courses are also available to provide emphasis specialization in areas such as advanced materials (e.g. composites, nanomaterials and polymers), bioprocessing/biochemical engineering, energy technology, environmental engineering, and petroleum engineering. The vision of the CBE Department is: To provide nationally and internationally recognized chemical and biological engineering education and research. Graduates apply fundamental and practical knowledge of unit operations, thermodynamics, reaction engineering, process control and design of safe, economical and sustainable chemical/biological processes. Graduates are successfully employed and advancing in governmental and industrial positions requiring chemical engineering expertise. Graduates are prepared to succeed in graduate and professional programs. At the time of your graduation, you will have the characteristics described by the following Chemical Engineering Student Outcomes. Where do I find more information on Chemical Engineering at SDSM&T? Visit our webpage http://www.sdsmt.edu/CBE/ to learn more about chemical engineering at the SDSM&T. You will learn more about industries in which you can be employed, the AIChE Safety and Chemical Education Certificate Program, profession development opportunities, scholarship opportunities, CBE laboratories, and co-op, intern, and research employment opportunities while you pursue your degree as well as new initiatives within CBE. The courses listed in the curriculum have been chosen to develop a well-rounded education, beginning with the foundations of mathematics, biology, physics, and chemistry, and culminating with a capstone process design course at the senior level. Along the way, students develop competencies in fluid dynamics, heat transfer, mass transfer, thermodynamics, computer solutions to complex engineering problems, process control, kinetics, and reactor design, all the while developing their critical thinking, general problem solving, leadership and communication skills. Although a minor in chemical engineering is not available, you can obtain a specialization in biochemical engineering or an emphasis in emerging areas such as advanced materials, biomedical engineering, energy technology, environmental engineering, or petroleum engineering by tailoring your elective courses. The chemical engineering faculty at SDSM&T keep the curriculum current and dynamic. As a part of this evolutionary process, the faculty continues to develop innovative approaches to teaching chemical engineering lectures and laboratories. An example of this is the integration of process design and simulation throughout the chemical engineering laboratory experiences. Sophisticated process design simulators (such as the commercial software, AspenPlus and COMSOL), are being co-integrated with process design projects. Major funding for these developments have and continue to come from the National Science Foundation and from industrial sponsors. The chemical engineering faculty is also involved in the university’s Tablet PC Program. Tablet PCs have been used to explore new ways to deliver courses and integrate into the curriculum sophisticated process software. In addition, SDSM&T offers the opportunity for students and professors to interact in small groups and individual learning sessions. Students working in conjunction with their advisor need to ensure General Education Requirements are completed in the required timeframe. Hum/SS electives require 6 credit (cr) hr each from Humanities and Social Sciences. The academic advisor recommends and approves courses to take if students are interested in an emphasis in one of these areas: advanced materials (nano materials, polymers, ceramics, materials processing, corrosion, or solid state/semi-conductors), biomedical engineering, energy technology, environmental engineering, or petroleum engineering. A specialization in biochemical engineering is also offered. Select 3 credits from engineering courses other than CBE prefix; requires advisor approval. These courses are typically at a 200 level or higher.